The Gospel reading from the Mass for the Solemnity of Mary, the Holy Mother of God is Luke 2:16-21. Responding to an angel’s miraculous announcement of Christ’s birth and the wondrous apparition of an army of angels praising God, the lowly and rough shepherds who kept watch over flocks at night hasten to find Christ. Arriving in Bethlehem, the shepherds located the Holy Family amidst the animals in a stable, built in the shelter of a cave. Overwhelmed, the shepherds described, in-depth, the fearsome appearance of the angel, the announcement that Christ was the long-awaited Messiah and the awe-inducing sight of army of angels worshipping God; while it is unclear who else was present besides the Holy Family, all wondered (to be astonished or “thunder-struck”). However, rather than being astonished, Mary quietly observes God’s miraculous acts and meditates deeply upon them in her heart. Consistent God’s covenant with Abraham 2000 years earlier (Gen 17:9-14), Jesus is circumcised on the eighth day, confirming Jesus’ solidarity with God’s chosen people, Israel; Joseph and Mary fulfill all the requirements of the Law (Luke 2:22-24, 41). Joseph, the man chosen by the Father to be the adoptive father of Jesus, presents Christ to a rabbi for the circumcision and names Him Jesus (“God saves”), as revealed to Mary (Luke 1:31). The Church has venerated Mary since early days. God’s selection of Mary to be the Mother of God, Christ’s care for her during His public ministry and His giving of Mary to John at the Crucifixtion set the foundation for Mary’s veneration. After the Ascension, Mary was treated with great reverence by John and was “interviewed” by Luke in the writing of Luke’s Gospel (Infancy Narratives). The early Church Fathers continued to venerate Mary, proclaiming Mary was the Theotokos (“Mother of God”) in the 5th century. More recently, the Church confirmed as dogma (a binding teaching) the long-held tradition of Mary’s Immaculate Conception (1854) and of the Assumption (1950). In 1964, Mary was reconfirmed as “Mother of the Church” and in 1969, the Solemnity of Mary, Holy Mother of God, replaced the Feast of of the Circumcision of Christ on January 1. Awed by Jesus Christ – Son of God, Christ’s birth is miraculously announced to shepherds, filling them with both fear and joy and compelling them to search and find Christ in Bethlehem. Son of David, Christ is born in David’s home town of Bethlehem as prophesized in the Old Testament. Divine King, Christ upholds His own covenant with Israel by being circumcised. Son of Joseph and Son of Mary, Christ is shepherded and guided in the Jewish faith by Joseph and Mary. 1) Marvel at the spectacular way the Father confirms His blessings to Mary and Joseph by sending a glorious army of angels to lowly shepherds who, in their awe, come an proclaim the miracle to Mary and Joseph. 2) While billions of women have been born, ponder the stunning truth that only one, Mary, was chosen to be the Mother of God. During Christmastime, renew your understanding that Mary is the Mother of God (CCC 493, 495, 508-509, 963, 2619, 2677) and pray for Christ to help you to grow in awe and honor of God’s chosen mother. 3) The Solemnity of Mary the Mother of God is a reminder as the new year starts that all men need to venerate and rely on Mary’s most powerful intercession to help them in the spiritual combat. During Christmastime, reflect upon the Devotion to Mary (CCC 971-972, 975, 1014, 1172) and pray for Christ to help you to grow in devotion to His beloved mother. The Gospel reading for the 7th Day in the Octave of Christmastime is John 1:1-18. While John’s Prologue (John 1:1-18) is not top of mind when thinking of Christmas, the Prologue a beautiful and stunning summary of the blessings mankind receives at the Nativity of Jesus Christ. John confirms that Christ is the Son of God who comes into the world to allow all men who receive Him to become adopted children of God and to enter into eternal life. Christ’s identity as the Son of God is revealed. Christ is with God before time and space exists in the beginning before the Creation (Gen 1:1-5). Christ is “with God”, confirming that the Father and the Son are different Divine Persons, and “was God”, confirming the Divinity of Jesus Christ. As the “Word”, Christ is the Father’s spoken word in which God establishes Creation and redeems fallen men through the Incarnation of the Word; Christ is wisdom itself. Christ is the source of life (both on earth and in Heaven), light, truth and mercy and has the power to reveal God (through His miracles and wisdom) and to grant men who believe in Him to enter into eternal life. While the world does not recognize Him (1:10) and Israel rejects Him (1:11), those who respond and receive Him are given astounding blessings: to receive enlightenment and truth, to receive faith, to receive truth, to know God, to become children of God, to receive grace upon grace (mercy), to receive eternal life and to behold His glory. No man can receive these gifts through inheritance, natural birth, or will (v. 13); only through faith in Christ Jesus can men be saved. Awed by Jesus Christ – Son of God, Christ is with the Father before Creation and is God. Divine Wisdom, Christ is the Word uttered by God to create the world and brings light and truth and grace to the world to redeem it. Savior and Divine Mercy, Christ allows those who believe in Him to become adopted children of God and to receive eternal life. 1) Ponder and be astounded at Christ’s role in Creation: He exists with the Father before Creation (estimated to be 10+ billion years old) and causes Creation to occur (time, space, molecules, stars, planets, life forms, and men who are created in His Image). 2) While men often lose the great awe at the mystery and joy of Christmas they had as children, deep down, all of men’s searching and struggles are a desire for God. At Christmastime, reflect upon Men’s Desire for God (CCC 27-30, 44-45) and pray for Christ to turn your desires away from the world and towards Him. 3) The lukewarmness of so many Catholic men is because they don’t know Christ Jesus: any man who meets and gets to truly know Jesus are miraculously conformed. At Christmastime, reflect upon Knowing and Speaking of God (CCC 31-42, CCC 46-49) and pray for Christ to meet Him and know Him. The Gospel reading from the Mass for the Feast of the Holy Family Cycle C is Luke 2:41-51. In Luke’s Infancy Narratives (Luke 1-2:40), the Blessed Virgin Mary gives a firsthand account of Christ’s early years (Luke is thought to have received the account of Christ’s childhood directly from Our Lady some years after the Ascension). God selected holy and observant Jews to form the Holy Family for His Son; Mary and Joseph closely kept the Jewish religious practices (Sabbath, circumcision, presentation at the Temple of the firstborn, annual Passover pilgrimage). In this reading, Mary recalls the harrowing experience of losing the 12 year old Jesus during Passover and finding Him three days later in the Temple. For protection from road robbers, Mary, Joseph and Jesus walked the long journey (about 90 miles) from Nazareth to Jerusalem with a large group of family and acquaintances. After offering sacrifice at the Temple and keeping the Passover, Mary and Joseph leave with the large caravan, assuming Jesus is with the group as was the norm, but at the end of the first day, realize Jesus is not with them. Anxious, they return the next day and search for Jesus for another day; on the third day they find Jesus in the Temple. Christ, demonstrating both His divinity and the excellent job Mary and Joseph have done in teaching Him, amazes (literally, thunderstruck) learned rabbis in the Temple; at 12, Christ is listening and questioning like a seasoned rabbi. Ironically, some 20 years later, Christ will again teach at the Passover, be betrayed by Jewish priests and Crucified by Pilate. When Mary and Joseph ask why He has caused them great anxiety, Christ, the Son of God, offers His first recorded words in the Gospels, “Did you not know that I must be in My Father’s house?”; Mary recalls that she and Joseph did not understand Christ’s response at that time, but the Holy Mother pondered His mysterious words deep in her heart. With Christ’s astounding performance amongst the most learned of Israel, He most assuredly would have been asked to remain as a student/disciple of one of the top rabbis. Rather than remain, Christ, in obedience to Mary and Joseph, returns to Galilee to grow in fullness of stature of manhood. Awed by Jesus Christ – Son of God, from His earliest days, Christ seeks to draw closer to His Father in Heaven. Person of the Trinity, Christ chooses the Blessed Virgin Mary to be His own mother and causes her to be born without sin. Divine Teacher, Christ amazes the brightest of Israel, even as a young boy. 1) Marvel at Christ’s ability to “amaze” the brightest minds on earth, the most learned of Israel, with His knowledge and intellect at the age of only 12 years old. 2) Despite the post-modern confusion about society and the family, as established by God the Father in Adam and obediently maintained by Israel, God’s plan for humanity is for it to be led by a patriarchy (governed by male elders). Christ confirms the sacrificial role of patriarchs by calling of Joseph to be His earthly father, by forming 12 men to be His Apostles, by appointing Peter and successive popes to lead His Kingdom on Earth, by establishing the male priesthood and by sacrificing Himself in the Crucifixion. During Christmas time, reflect upon God’s Plan of Patriarchy (CCC 261-267, 1297, 1312, 1577, 2214, 2571) and pray for Christ to help you grow into a sacrificial leader like St. Joseph. 3) God’s plan of patriarchy (governed by male elders) is confirmed by the model of the Holy Family, which becomes the first “Domestic Church Militant”; the Domestic Church is the formed in the Sacrament of Matrimony, led by the father with the mother and who together welcome children; the Church Militant is Church on earth in Christ’s Kingdom which is engaged in the Spiritual Combat with the Domestic Church Militant forming the smallest cell. During Christmastime, reflect upon the The Domestic Church Militant (CCC 954, 962, 1655-1658, 1666, 2204, 2210, 2685) and pray for Christ to establish and guide you in the leadership of your own Domestic Church Militant. The Gospel for the Mass for the 5th Day in the Octave of Christmas is Luke 2:22-35. God selected holy and observant Jews to be the parents of His Son. Joseph and Mary presented Jesus for circumcision and naming eight days after the Nativity and now fulfill their next religious obligation: the purification after-birth rituals (Lev 12) for Mary and the ceremonial presentation of their first born son 40 days after birth (Exod 13:11-16). Even though Mary is Immaculate and remains miraculously a virgin even after the birth of Christ, she nevertheless presents herself for purification to fulfill and Law and avoid scandal. The presentation of Christ fulfills the obligation for a Jewish first-born male, consecrating Him to the Lord. Mary and Joseph’s offering (two small birds) meet the requirements of the poor; Christ is counted among the poor He comes to save. Simeon, a devout old man, has long waited for God’s promise that he would see Israel’s salvation; the sight of Christ fulfills God’s promise to Simeon and he is moved to prophesey. Simeon’s hymn, called the Nunc Dimittis (Latin, “now dismissed”), confirms Simeon may die in peace and joy, knowing Israel’s promised salvation has come. 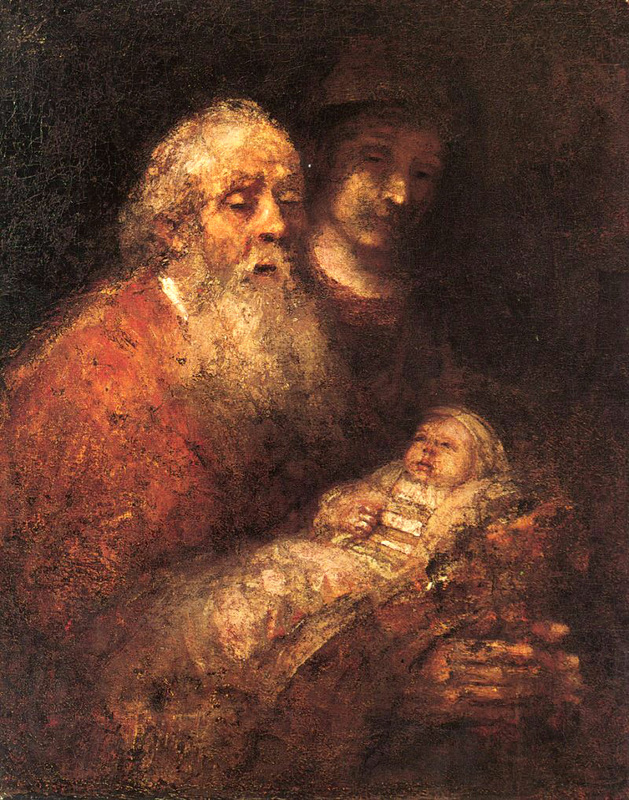 Beyond Simeon’s comprehension, he is given the profound blessing of holding God in his arms. Simeon’s prophecy is a bittersweet consolation to Mary and Joseph. Simeon reveals Christ’s mission of salvation to the world and he blesses the couple, giving Mary and Joseph joy. But Simeon also reveals the coming Judgment Christ will bring upon the people and that Mary will suffer deep sorrow (“a sword will pierce through your own soul”), causing Mary and Joseph sadness. Simeon, an instrument of God’s grace, prepares and strengthens Mary and Joseph for their coming trials. 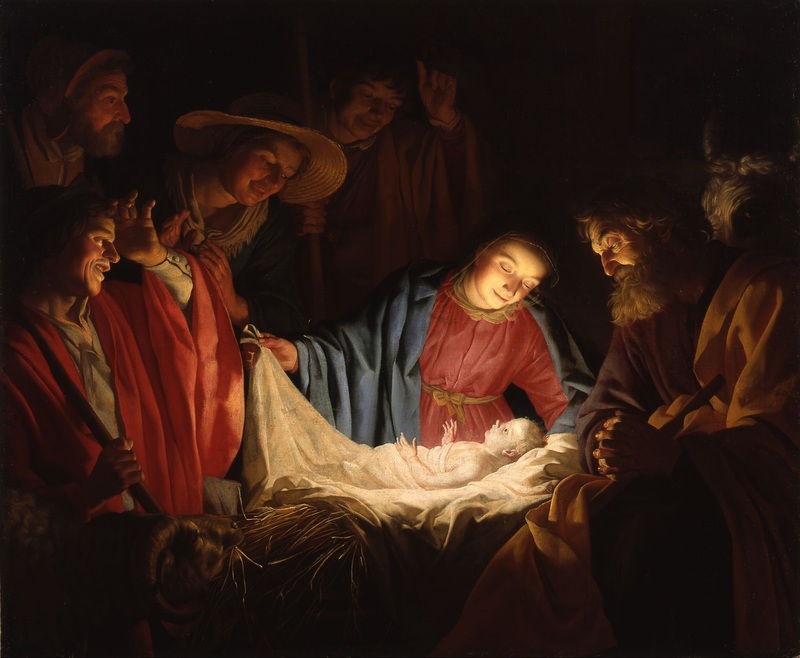 Awed by Jesus Christ – Son of God, Christ’s divinity is revealed to Simeon, a devout old man who God prepared for a lifetime to offer his exaltation. Son of Mary and Son of Joseph, Christ sends Simeon to give His parents consolation. Divine Mercy, Christ allows Simeon to both witness and proclaim His coming salvation. 1) Luke’s Infancy Narrative, which come from the Virgin Mary’s recollections, are full of mysterious revelations. Be awed by Christ’s preparation of Simeon (God had promised Simeon that he would see the Christ) and how Christ’s divinity is recognized by Simeon. 2) In God’s infinite wisdom, He desires that all men have the blessing of a mother (and father!). Mothers, like all humans, are prone to sin and fail their children in various ways, sometimes causing deep wounds; and all mothers eventually die. In the Blessed Virgin, Christ has given the Church a perfect mother who never fails to love those who come to her. During Christmastime, realize your deep need to grow in Devotion to the Virgin Mary (CCC 963-975) and pray for Christ to help you imitate His perfect love for His Holy Mother. 3) Simeon prophesizes that Christ will be the cause “the fall and rising of many.” During Christmastime, reflect upon the need for a regular Examination of Conscience (CCC 1454), conduct a rigorous Examine and go to Confession, praying that Christ helps you to continually rise towards sainthood and Heaven. The Gospel for the Mass for the Feast of the Holy Innocents is Matthew 2:13-18. Following Christ’s humble birth in Bethlehem, Wise Men (the Magi) travel from the East (likely Persia), compelled by the sign of a star in the sky; this fulfills a 1200 year-old prophecy of Christ’s birth (Num 24:17). The Wise Men mistakenly disclose their mission to locate the Christ child to the evil King Herod. Warned in a dream by God of Herod’s intention, the Wise Men avoid Herod after paying homage to Christ and return to their homeland. Herod’s grave threat to Jesus is also revealed to Joseph, Guardian of the Redeemer. Responding in faith, absolute obedience and urgency to the angel’s warnings about Herod’s murderous intent, St. Joseph immediately acts to protect the young Virgin Mother and the newborn Babe Jesus. Waking from the dream in the middle of the night, Joseph takes Mary and Jesus to Egypt, an arduous and dangerous journey of several hundred miles. The Magi’s gifts of gold, frankincense and myrrh sustained the Holy Family as Joseph sought work as a carpenter in Egypt. The Holy Family remained in Egypt until Herod’s death, returning to Nazareth when Christ was a young child; this fulfills Hosea’s prophecy (Hos 11:1) which echoes Israel’s deliverance in the Exodus and foresees Christ’s own return from Egypt. King Herod’s evil is documented in non-biblical sources (murders multiple wives and sons and many others). Furious that the Wise Men did not reveal Christ’s location and paranoid about the threat of Christ’s coming kingship, Herod had all the male children under age of 2 of Bethlehem murdered. 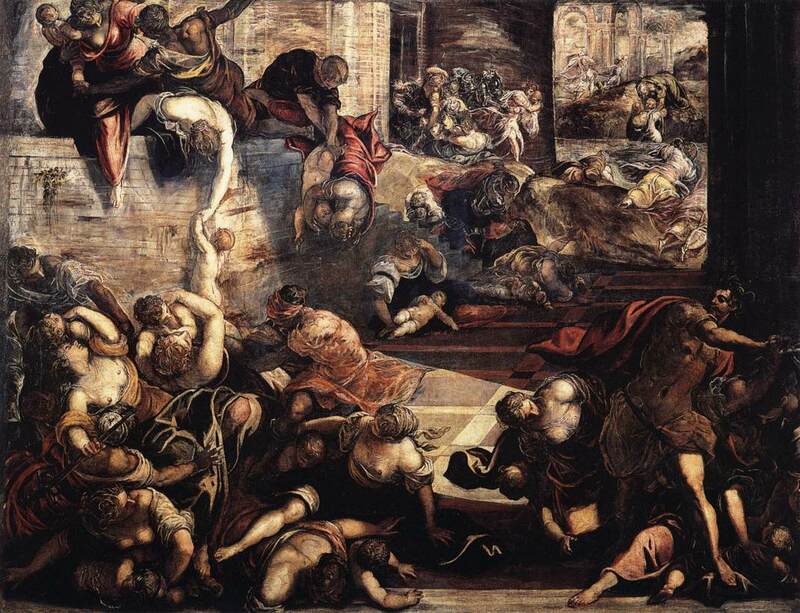 These Holy Innocents are considered to be the first Christian martyrs. Awed by Jesus Christ – Son of God, Christ is protected by the Father through the intercession of angels. Son of Man, Christ is protected by His foster father Joseph and cared for by the Virgin Mary; the gifts of the mysterious Wise Men also helped the Holy Family. 1) God the Father’s plan of Salvation History through His Son can not be stopped by even the most powerful of men. Marvel at how God works through angels, the Wise Men and Joseph and Mary to protect His Son. 2) From Christ through today, the Church has always valiantly sought to protect children: the Gospels mourn the loss of the Holy Innocents, God’s intervention to protect Jesus, Joseph’s heroic actions, the Didache (1st century Church doctrine) forbids abortion and infanticide. During Christmastime, renew your understanding of the evil of Abortion (CCC 2270-2275, 2322) and ask Christ to help you to grow in vigilance for the protection of unborn and born children. 3) While almost all fathers would defend their children to the death from physical abuse, many Catholic fathers fail to protect their children from the spiritual abuse (corruptive media, bad “friends”, perverted ideologies, consumerism, etc. ); while most men have the vocation to be biological fathers, every single Catholic man is called to be a spiritual father. During Christmastime, review the Duties of Catholic Fathers (CCC 5, 1653, 1656, 2221-2231, 2688) and pray that Christ strengthen you to be a spiritual father to your own and other children.